Do I make social media look easy? Do other’s in my biz make you feel like there is no way you can compete with their posts? Does frequent social media seem so effortless for most people you follow, as you struggle daily with figuring out what, why, how to post? You all know (I hope you know) that I use MANY tools to keep my social media, and my client’s social media, humming along. This is NOT a one woman show, nor could it be with the volume of information we are all trying to compete with out there in the virtual stream. I can’t go it alone, and neither can you. So if this blog finds you sitting there stressed and overwhelmed about your social media plan day after day, then grab a cuppa coffee (or beverage of choice) sit back and read on. 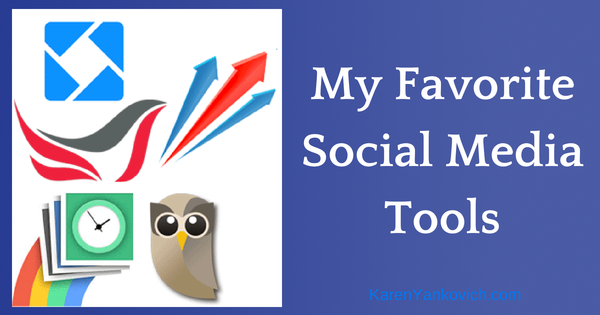 I’m going to share with you some of MY favorite social media tools that make my life EASIER and why. I have talked about Social Oomph before and it really is one of my go-to Twitter tools. One of the best features, available even with a free account, is the “set it and forget it” feature. You can upload a list of tweets, schedule the post times, and then “forget it” meaning Social Oomph will post a tweet at your scheduled time, then add it to the back of your rotating queue. This tool is for those of you who have been playing on Twitter for a bit, as it has some more subtle, but very powerful features. I recommend using this tool when you are massively growing your list and then maintaining an active Twitter account with a high number of followers. In the free subscription plan, and for $12/month you can get access to features I really like. For example, when building your Twitter platform it is important to search for and follow people who are relevant to you. The Follow feature on Manage Flitter will keep your follow list topped up by copying another person’s followers to follow and by automatically reciprocating when someone follows you. Conversely the Unfollow feature helps keep your followers list clean and more importantly, more useful. This tool can show you who didn’t follow you back, which accounts are inactive, and how influential they are, to help you decide who deserves to stay in your list and who does not. A third tool of Manage Flitter that I like is the PowerPost tool (this tool requires a monthly fee). With the help of analytics this feature allows you to choose how and when to schedule your Tweets for the most impact. Easily select your most powerful and relevant posting times so your Tweet gets seen by the people you want to see it. Hootsuite is a powerful scheduling and organizational tool that I like a lot because you can see all of your social media platforms at a glance, you can bulk upload, and schedule posts to multiple platforms at once. The free plan is more than enough for a solopreneur who is handling all your social media yourself. One nice feature I like is I can give my VA access to my Hootsuite account who can then upload and schedule for me without having access to all of my logins for all of my accounts. Hootsuite is definitely a great “one-stop-shop” and worth taking the time to learn to navigate the few key features I mentioned above. Finally a tool to schedule Instagram! Instagram is a platform that should not be missed for anyone who is in business. Especially if your business is product based, travel based, really anything that is visually appealing needs to have a presence on Instagram. But until now Instagram could only be accessible via photos uploaded on your smart phone, which really made it difficult for a busy on-the-go entrepreneur to use. Believe me I know! With Schedugram you can upload multiple posts, schedule posts easily, and create a scheduled sales campaign for multiple Instagram accounts, all within the application. There is no free subscription level (only a 7 day free trial period) but if your business relies on Instagram for its simple and visual beauty then look into this tool to help you manage your posts on this platform with ease. If Instagram is your go-to platform or you are looking to make headway there, this tool will help you do it. And it’s free to boot! I know you hear a lot about “analytics this, analytics that,” and I know that information can be overwhelming and confusing to say the least. With Iconosquare your analytics information is set out in a very easy to read and understandable format. You will find out who your new followers are – so you can talk to them directly if you want! You will find out which followers you lost – which is just as important when dialing in your social media message. You will be shown which posts were the most liked – a fantastic piece of information as you decide how to structure your message and what to say. This tool will also give you prompts on which hashtags to use that garner more attention and more hits. Something we could all use help with. So there you have it, 5 of my favorite tools to help you navigate the social media world. With these tools in your tool kit it’s almost like having your own social media coach whispering in your ear giving you advice along the way! Questions? Comments? Concerns? Join my LinkedIn Group! Want to know how LinkedIn fits in here? Join my LinkedIn Group! Just want to say hi? Excellent! Join my LinkedIn Group! Together we will figure out the social media machine, one platform at a time. Thank you so much for sharing, I didn’t know about most of them and will definitely check them out as I’m still learning how to manage my social media marketing on my own! I was wondering what tool you would use to schedule quote images to go out through twitter. I have been using Hootsuite but on Twitter it only shows the ow’ly link not the image. Is there a tool that does this? Cindy, Social Oomph does that! Great post! Though a little overwhelming. I know there’s SO much out there I don’t know about – I’m only managing FB at this point, and not doing that so well. I think the idea with HootSuite that you can see it all and manage from one spot. Thanks for these resource! All in time, right? Love these juicy tips. I have a client who is starting to leverage instagram so this is GOLDEN!